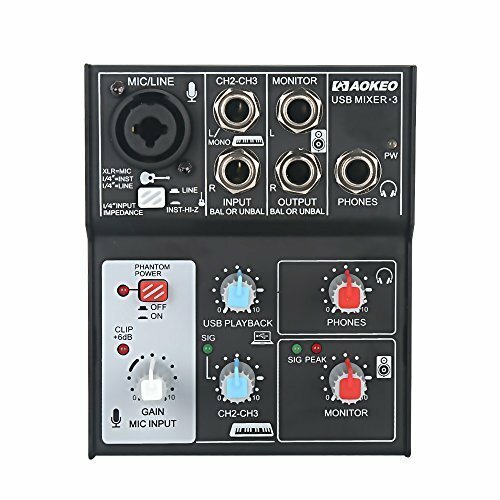 The Aokeo Mixers is like a portable recording studio. It's perfect for computer-based audio editing, while adding fine-tune adjustments to your sound. Connect to your computer via the USB port and this audio interface mixer has the ability to function as the sound card. System features include 48V phantom power supply, XLR microphone input, 3.5mm (1/8'') microphone input, 3.5mm (1/8'') headphone jack, RCA (L/R) stereo input & output connectors, 2-TK RCA (L/R) Input Connectors, audio signal clip LED indicator lights, input selection control buttons. Adjust each input's gain, master gain and monitor levels using the rotary faders. System includes USB wall adapter power supply & connection cable. Pick the mixer for your best needs from our mixer 3, mixer 5 and mixer 6. Select the right mixer for your needs of Channel inputs and BAND EQ from our options of Mixer 3, 5 and 6. *NOTE: There for no BLUETOOTH!